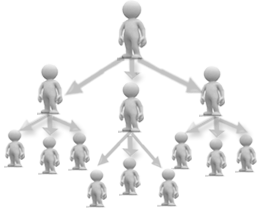 This Forced Matrix Plan is similar to Unilevel Matrix plan but the amount of people each person can have in their first level is limited. A 3x9, 5x5, 5x7 Forced Matrix plans are very popular in Forced Matrix. Forced Matrix Plan is also sometimes called as Matrix Plan. This is a compensation plan that set limits to your organization. Though there are many variations to this model the basic concept is the same. The construction is simple. A 3x5 plan for example, allows you to sponsor 3 frontline members and your commission will be paid up to 5 levels deep. A 5x7 plan allows you to sponsor 5 frontline members and you are paid 7 levels deep. Here is a 3x9 matrix worked out for you. Other popular plans include the 6x4 and the 2x12 structures. Like the Binary Plan, once you've filled the maximum number of frontline members, any new members will "spill over" and are placed under someone in your down line.